Broadsword has many kinds, such as willow leaf broadsword, double broadsword, belt broadsword, tiger head broadsword, money broadsword, etc. Shaolin broadsword belongs to willow leaf broadsword. This is a very popular type of broadsword and used by many people, and thus evolved into many different styles with changeable forms. 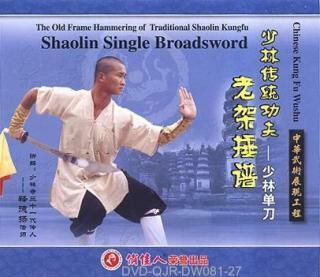 This Shaolin Single Broadsword (Shaolin Dandao) routine is composed of movements such as splitting, sweeping, teasing, cutting, stinging, etc. It can attack directly the vital parts such as head, body, neck and chest, etc. Due to its compact size, the movements could be so rapid and vigorous that your opponent is difficult to defend. • Liuye Dao or "willow leaf saber" is a type of dao that was commonly used as a military sidearm for both cavalry and infantry during the Ming and Qing dynasties. This weapon features a moderate curve along the length of the blade. This reduces thrusting ability (though it is still fairly effective at same) while increasing the power of cuts and slashes.